In case it’s not obvious yet, we love speedrunners! We’re part of the Humble ‘Awesome Games Done Quick 2015’ Bundle early this year where an XSplit license was included in one of the bundles. 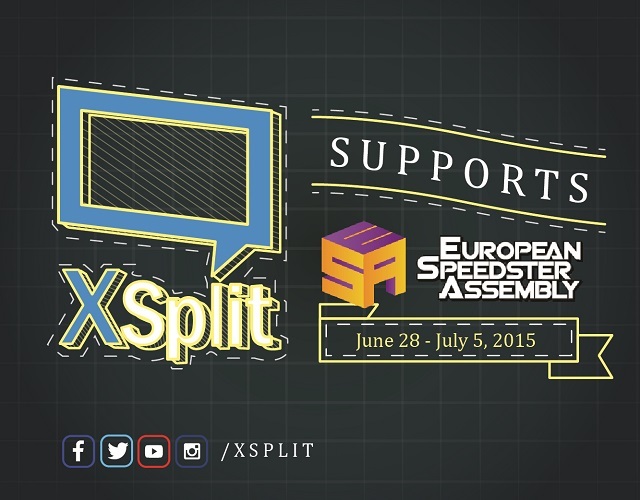 For this month, we are supporting another speedrunning event named European Speedster Assembly also known as ESA this coming June 28 - July 5 2015. ESA is an annual speedrunning marathon organized by the Swedish speedrunning community. It’s an event that is held physically in Sweden, but the interesting part is there are people from other countries who will attend the event either to speedrun or spectate. Their full schedule (including games to play) for the event can be found here. We highly encourage you to watch their marathon to witness the best speedrunners of Sweden! Aside from that, there will also be some fun and exciting activities during the event which will of course include XSplit license giveaways and many more. The event will be livestreamed at twitch.tv/esa and we will be promoting the event on our social media when it starts.